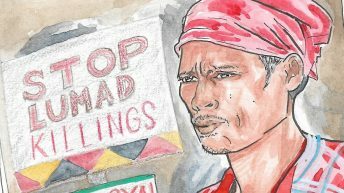 Almost two years after the brutal massacre in which the head of the Alternative Learning Center for Agricultural and Livelihood Development (Alcadev) was killed along with two Lumad leaders, the school in Lianga, Surigao del Sur still stands with its doors open for Lumad children eager to learn. But Alcadev is also open to dedicated volunteers who want to teach the Lumad youth and provide education relevant to their culture. With such task comes the risk, as the Lumad schools and communities are perennially under attack by government troops and paramilitary men. Lumad leaders and teachers have been red-tagged and charged with trumped-up criminal charges. Just last week, President Duterte himself accused these schools of “teaching subversion and communism,” and threatened to bomb them and the communities. Still the volunteer-teachers come, mostly graduates of the school themselves who pay it forward to the younger Lumad generation. But some teachers came from distant lands, and from lives so different from that of the indigenous peoples of Mindanao. Driven by the call to serve the people, three young graduates of the University of the Philippines (UP) took that risk and left everything they were used to, everything familiar, to teach and help defend the Lumad community. Chad Booc, 23, a Computer Science graduate of UP Diliman, hails from Cebu. In the College of Engineering, students scarcely have time for activities outside their demanding workload, but Chad made time. 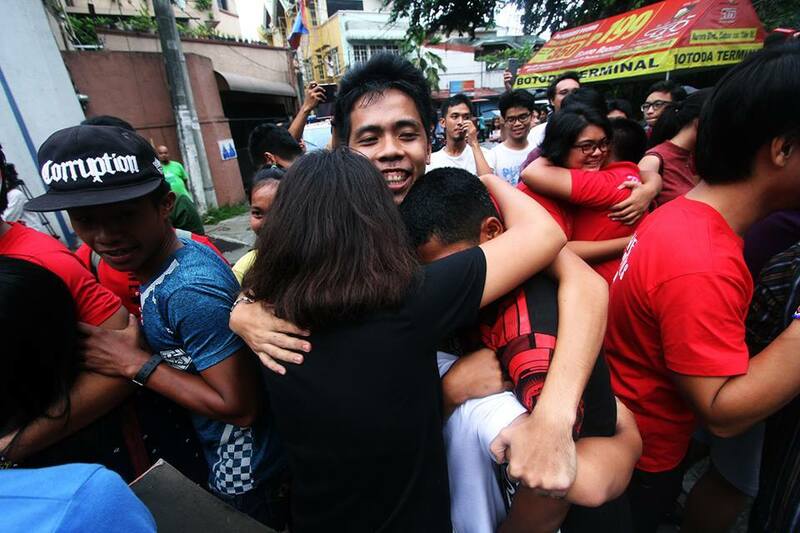 In 2013, he joined the progressive youth group Anakbayan-Engineering, and was exposed early on to the plight of the many oppressed sectors in the country, including that of indigenous people. In October 2015, a month after the Lianga massacre, the 700-strong, mostly Lumad Manilakbayan ng Mindanao camped out on the College of Human Kinetics grounds in UP Diliman. There they shared their stories about the militarization of their communities, and the violence they experienced from paramilitary forces. Under the many tents and makeshift shelters in the CHK grounds, Lumad adults and children alike gave a horrid account of how their leaders were shot right in front of them, how they were forced to leave their homes and abandon their livelihood. With half-lidded eyes and a soft smile, Chad recalled how his plans after graduation had gradually changed over time. Because he was a CompSci student, he could have been a software engineer or a programmer after finishing his studies, which would have earned a lot for him and his family. But becoming an activist and a volunteer teacher had changed his life. “Little by little, my life changed when I became an activist. Especially during Lakbayan, my life suddenly gained direction,” he said. 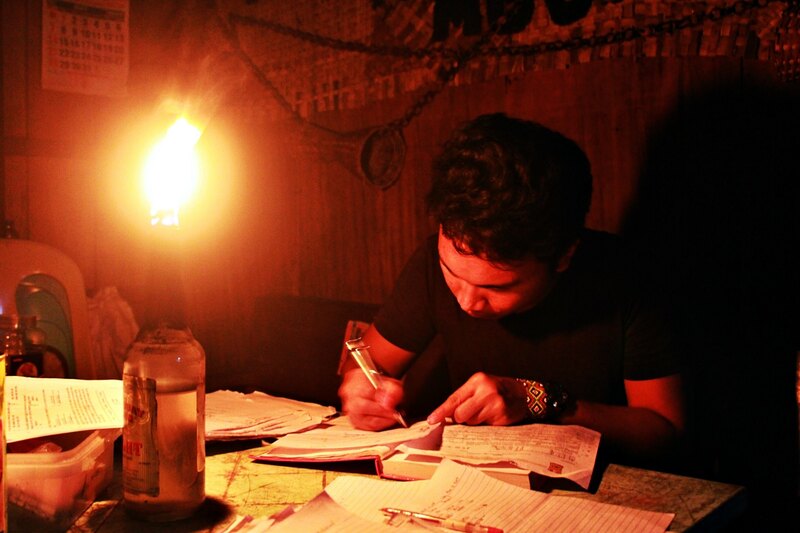 In 2016, a year after he first met the Lumad, Chad decided to come with the Manilakbayan back to Mindanao and volunteered to be a teacher for Alcadev. He now teaches math and science to first year up to third year students. If you asked the freshman Michelle Pagaran where she would be in four years, she would have never thought to say that she would be in Mindanao, teaching Lumad children. Michelle now is worlds apart from who she was when she first entered the university. The Psychology degree holder handles English and science classes for second year up to fourth year students. Mich, as her friends call her, initially thought she would end up in a profession close to her degree. But like Chad, Manilakbayan 2015 set her on the path where she is now. The soft-spoken Mich came from Butuan City in Agusan del Norte, just a bus ride away from Lianga. But that did not make it any easier for her to leave home and abandon job opportunities to go to Alcadev. Inspired by lessons she learned as a member of the cultural youth group Alay Sining, she heeded the call to work for a nationalistic, scientific, and mass-oriented education, and after a year’s worth of consideration, decided to become a teacher for Alcadev. Another member of Alay Sining, Kenneth Cadiang, 23, had always planned to be a teacher. 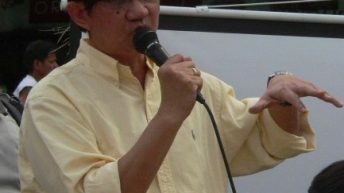 He initially took up BS Math in UP Diliman but just as he was about to start on his thesis, he shifted to BS Education. Kenneth understood the importance of education centered around the people’s needs, something he did not see in city schools, where he could have earned money. Instead, he found his true calling when he met the teachers and students of Alcadev in 2015. Almost two years after that fateful encounter, Pampanga-bred Kenneth packed his bags and headed to Mindanao. Kenneth teaches history, economics and math to third year and fourth year students, and values education to first years. As student-activists, Chad, Mich, and Kenneth were familiar with the dictum “serve the people.” It was printed on their shirts, a hashtag on their posts, a basis for all their calls during rallies. They matured with that phrase taken to heart, and it was the compass that gave them direction after college graduation. Thus, the road less travelled by took them from UP Diliman to Lianga, where their lives were never the same ever again. Before they left, they had to explain to their families their decision. All three admit that they had difficulty garnering the support of their parents, who expected that they will help their families financially after they graduate; not to mention the danger of being a teacher in a school targeted by the military. It is a continuing process, but little by little, their families get to understand the Lumad’s plight. Chad’s father has actually visited Alcadev, and saw for himself the dire need for teachers. After Chad’s tireless persuasion, his family is now supportive of his duty to Alcadev. The drastic change from the fast-paced life in the city to the hardy, bucolic setting was not so easy for the three young teachers. In their new homes, there is no electricity and cellular signal. They had to wake up early to help with the farming in the community. They also had to make do with what they have to carry on their work, because the school is understaffed. 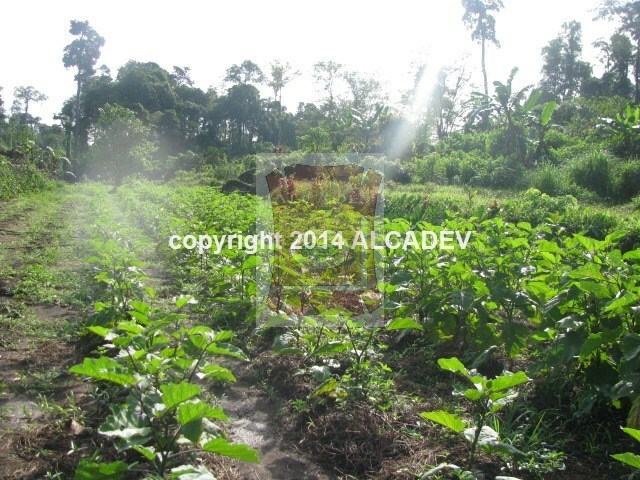 Still undergoing rehabilitation after a year in evacuation, Alcadev facilities and resources sometimes fall short. Chad, Mich, and Kenneth signed up to be teachers, but inevitably, they became students again because of the things they had to learn from the Lumad. During their stay, they learned how to farm, how to maintain a garden, how to chop firewood, and how to cook. They have also become students of the Lumad culture, and are now familiar with its traditions. But most important of all, they learned the essence of “collective action” – another phrase they lived with as UP activists. Now it has become more concrete for the three teachers. 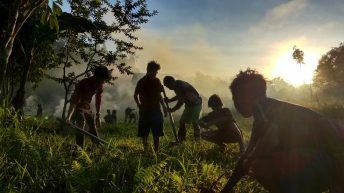 When they came to live with the Lumad, they realized the importance of aligning one’s goals to that of the community and its development. The community celebrated together, they solved problems together. Everything that is done by the individuals is to better the community. Once, they lived their lives as individuals – doing whatever they wanted, whenever they wanted to. 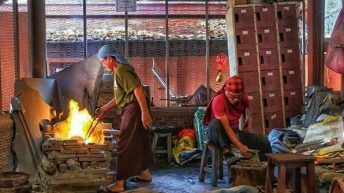 Now, they live as a crucial part of a community, one so different from what they were used to, that their coming there is like walking into a new life, where one’s past nuances are rendered irrelevant. Mich shared how her students are practical when it comes to appreciating their lessons; they often ask how their learnings can affect their families and their communities. Kenneth also talked about how seeing the students and the staff work together made him better at fixing his mistakes and improving himself for the good of the community. “‘Yung kaisipan kasi nila ay, hindi ka lang isang tao, hindi ka lang indibidwal para paunlarin ‘yong sarili mo; parte ka ng isang komunidad at ‘yon dapat ang paunlarin mo (Their mentality is that you’re not just a person, you’re not just an individual to improve yourself; you are part of a community and that is what you have to improve),” said Chad. Forced evacuation has become a dreaded but necessary part of the life of the Lumad, as they abandon their homes to escape military atrocities. Recently, the young teachers had their first experience of bakwit (evacuation). On July 5, news of military presence surrounding their area reached the communities. Bomber planes were heard flying overhead, inciting fear among the residents. A few days before, men from the 75th Infantry Battalion-Philippine Army were seen around the Lumad communities, including in Han-ayan, Diatagon village, where Alcadev is located. 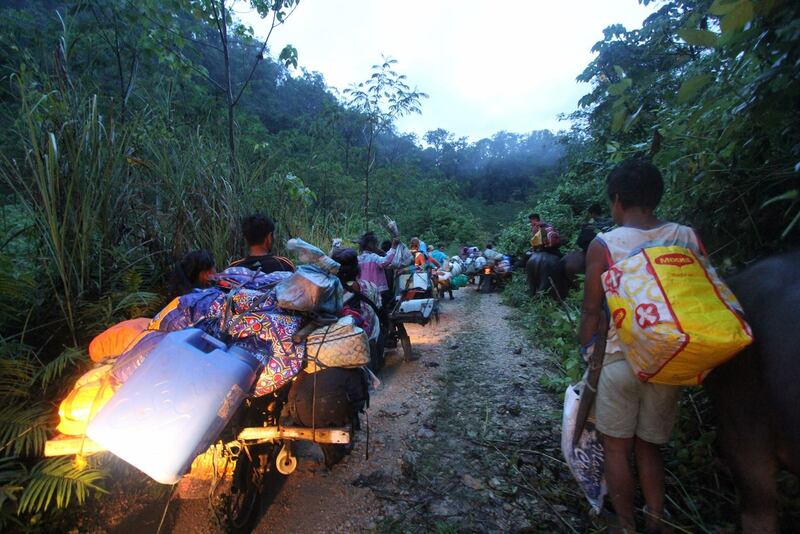 Fearing an attack from the military, especially under martial law, nine Lumad communities were forced to evacuate to Emerald community in Diatagon village, nine kilometers away from the national highway. Stringent military checkpoints prevented relief goods from reaching them. After a week, the more than 2,000 evacuees returned to their homes. On July 20, more than a hundred Lumad arrived in UP Diliman, among them the three volunteer teachers. 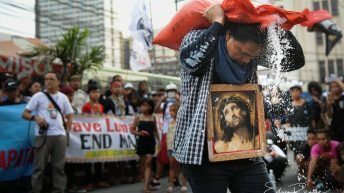 They joined the protest against Duterte’s State of the Nation Address (SONA) on July 24. Mich admitted there is as much fear among the teachers as there is among the students. Some students cannot sleep at night for fear that paramilitary men will come tearing down their dormitory doors. “Sabi nga ng mga bata, binibilang nila kung sino na ‘yong hindi na bumabalik; marami-rami raw yung tumigil sa pag-aaral. 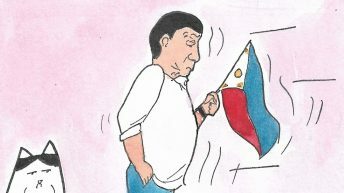 Noong dinig na sa komunidad na may mga militar, ‘yong mga magulang na mismo ‘yong natakot. Isa-isa nilang kinuha ‘yong mga anak nila (The children told me that they’ve been counting those who don’t come back; there were a lot who stopped coming to school. When the community heard of the military presence around the school, the students’ parents became fearful and took their children home),” said Mich. But the teachers and staff try their hardest to encourage the students to stay in school. Mich said that even the students themselves comfort each other during such trying times. Close to tears, Kenneth shared his sadness over the Lumad’s plight, especially how the Lumad are so eager to learn yet there are forces keeping them from doing so. “Gusto nila matuto. ‘Yong pinagkakait sa kanila, pagpapalayas sa kanila, ‘di ko s’ya matanggap talaga kasi kailangan nila ng edukasyon (They just want to learn. What they’re being deprived of, the way they’re being forced to evacuate, I can’t accept it because they need education),” said Kenneth. On July 22, Chad and Kenneth were arrested along with six other youths at the House of Representatives after staging a lightning protest against the extension of Martial law in Mindanao. They were charged with disturbance of proceedings under Article 144 of the Revised Penal Code. They are now out on bail, but the charges have yet to be dropped. Just like their lightning protest at the House of Representatives, they look at the Lumad’s urge to learn as a way of fighting, to guard against those who wish to exploit the communities. 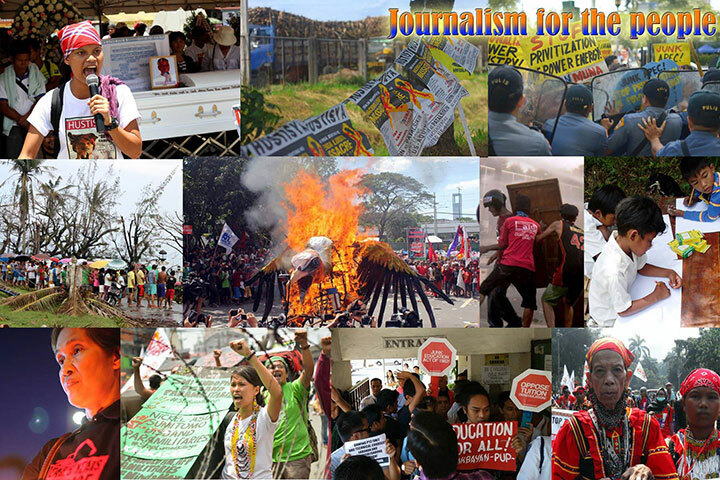 “For the Lumad, education is like a weapon against those who want to take advantage of them. In the past, the Lumad are often taken advantage of because they know nothing about money, about their rights,” said Chad. Although visibly exhausted after their release from detention, Chad and Kenneth remain faithful to their responsibility. They maintain their stance against the extension of martial law, which they see as something that will encourage more military attacks on their community. “Imbis na matakot ako dahil sa ginawa na pamamaslang sa eskwelahan, lalo akong nahamon na tumulong sa kanilang pagpapaunlad ng kanilang paaralan, kasi nakita ko ‘yong kagustuhan talaga nilang mag-aral para mapaunlad ang kanilang community (Instead of being scared because of the violence the school has experienced, I am even challenged to help in the development of their institution because I saw their eagerness to learn in order to improve their community),” said Chad. This August, the Mindanao lakbayanis are homeward bound. Although wary because of the extension of martial law in Mindanao, the volunteer teachers remain steadfast in their duty to the Lumad community. They will return to a threatened home, but they know that is where they should stay. With them are lessons acquired through a culmination of their experiences in the university and in Alcadev, lessons that have taught them the importance of opposing state neglect and violence. “To fight is just. Because that is real life, that is reality; there are people who are dying, people who are forced to evacuate. That reality is what pushes the need to fight. And getting an education and learning is a form of fighting,” said Kenneth.